Summer in NYC means a lot of free and low cost outdoor events. Get ready to add another one to your calendars! I’ll be teaching my 2nd Annual Yoga in the Park series in August. I taught four free open-level Vinyasa Yoga classes in Prospect Park last summer, and I’ve decided to bring it back this year, but with a twist. You can donate any amount you want for each of the classes (as a guide, $10/per person is what I usually charge for my fall and winter classes at the Zen Center, but even $0 is fine by me) and all of your donations are 100% tax-deductible! Here’s the info on the classes, if you’d like a flyer or you have any questions just ask! There are nearly 108 theories as to why 108 is significant in Eastern thought: There are 108 delusions that plague the human mind and 108 negations that Buddha offered to help us see them. There are 108 energy lines that converge to form the heart chakra. Divisible by the sum of its digits—which add up to the divine number 9—108 is considered a joy-giving or Harshad number in Sanskrit. And on and on, but you don’t have to understand or even care about any of those reasons to understand that doing 108 sun salutations is no easy feat. 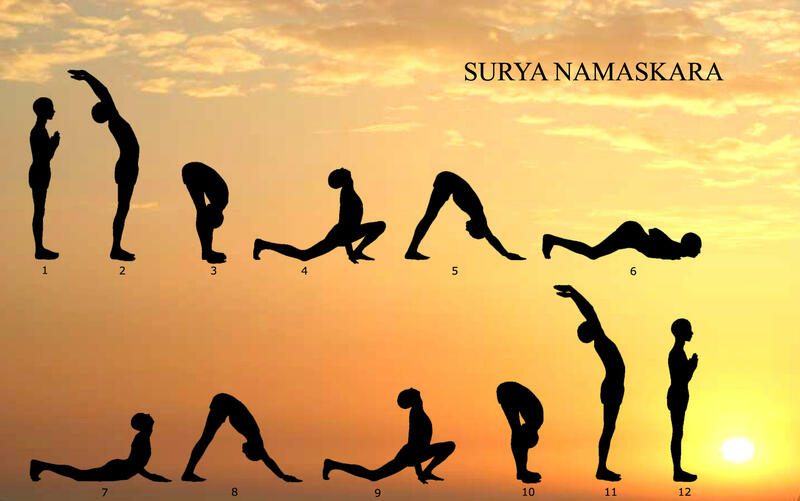 (One sun salutation, just in case you don’t know is the complete series of the yoga poses (or asanas) in the image above). Think of the Great 108 as a yogi’s 5k. The Strong Kids Campaign is the annual fundraising initiative that works to raise money to support the YMCA’s programs and financial assistance to those in need. I’ve been a member of my local YMCA since I moved here almost 7 years ago–it’s a great place and one thing I love about it is that no one is turned away because of their inability to pay–health and fitness shouldn’t be something available to to those who can afford to pay $100/month for a gym or yoga studio membership. When I lost my job, I was able to get the cost of my monthly membership slightly reduced so I could still go to the yoga classes that I love–that made a huge difference. This program also offers all kinds of great things like after school programs and summer camp. Read more here. If you’d like to help me reach my fundraising goal of $108, but can’t make it to the yoga classes, contact me. I’m not sure if the 108 or your series are going down when Ryan are going to be out of town this August otherwise we’d love to participate. Thanks for sharing!